Mystery Car Photograph Surfaces – Yet Another Manta Ray? The pair of F-86’s and the mountains in the background of the image suggest that the location might have been at the Muroc AFB near Lancaster, CA, or the Norton AFB in San Bernardino, CA. The F-86 Sabre, the USAF’s second production jet aircraft, made an initial flight on October 1, 1947, at Muroc (now Edwards AFB) and was placed in service beginning in 1949. Using all of these visual clues can any of our readers identify and date this car or add more to the story? Dan Strohl at “Hemmings Daily” covered the story of another early-1950s Manta Ray that will be on the field a month from now at the Amelia Island Concours d’Elegance. The photo is courtesy of the AACA Library. Update – Thanks to reader Paul Jaray this mystery has been solved: The custom car was constructed on a 1934 British BSA car chassis and was a project constructed by the members of the Arizona 197th “Copperheads” Fighter Inceptor Squadron, an Air National Guard unit. 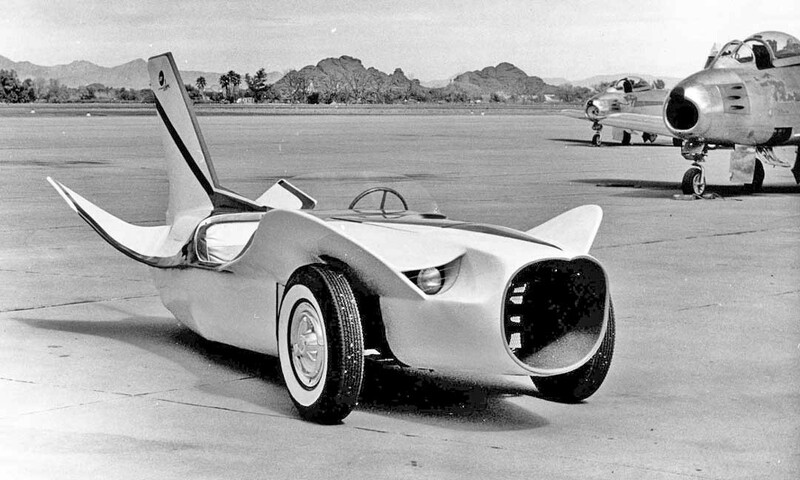 Learn all about the “Sabre Jet”car in the “Popular Mechanics” September 1957 issue. This entry was posted in Auto photos 1946 - 1965 and tagged 1957 "Sabre Jet"car, Edwards AFB, F-86 Sabre jet, Gm Manta Ray, Mako Shark concept car, Muroc Air Force Base, Oldsmobile Fiesta, Streamline Car. I wonder how a wind gust would affect this with those wings. I agree. I would venture to say that there would be considerable front end lift at anything approaching even modest highway speeds. It looks like a well crafted homebuilt to me. Security in the mid 50s was not what it is today, but maybe the builder/owner was an Air Force pilot. The first operational US jet fighter was the F-80 Shooting Star, a total of over 1,700 were manufactured by the time production ended in 1950. Bill, Thanks for the correction about the F-80 Shooting Star – I checked two online sources that told me other wise. Just proves the old adage – never trust anything you read online. I found this car long ago in a magazine…it was Popular Mechanics, september 1957, page 118. There appear to be circular cutouts just above the front wheels to allow for modest suspension travel. Otherwise I believe tire/fender contact would occur very easily. It would be interesting to know if this is a driveable vehicle. It appears to have double wishbone front suspension but given that there is either one lone or two closely spaced rear wheel(s), transmitting power rearward would have been a challenge. Could this be FWD? If so, to me, this heightens the mystery of who the builder is. Looks like it just swept down and swallowed a bug. Actually, and I may be wrong about this, I think the F-84 was the second jet to be introduced to the USAF, in 1947. Despite some early problems, the program continued before the Sabre was introduced in 1949. German data on swept wings was used to upgrade the Sabre and give it better performance as a fighter than the F-84, relegating it to a fighter bomber role. I read somewhere that the initial engines for the Sabre were made by Chevrolet before production was moved over to Allison. You are correct, and there were two F-84 versions. First the straight wing (4,450 made) (similar to the F-80) and then the swept wing F-84F (2,711 made). The F-86 was the 3rd production jet fighter. The car is clearly front-wheel drive. I recall reading that the BSA was FWD, and the drive shafts are clearly visible in the Popular Mechanics article, which has a link near the end of the above article. Reading further in the Popular Mechanics magazine from 1957, notice the following article on page 120. There is what looks like a Plymouth-based “ute” on the rail car. They where front wheel drive more than likely. The wing design appears to have a downward thrust to the front wheels because of vertical swing to them,unlike the old 59-60 chevy that would lift at 100+ mph. I would drive it till it quit. That is an old wives tale that the 59-60 Chevys would lift at 100 mph! I remember reading a “modern” test and it was found the cars to have front end lift. Should be able to google it! The cars were competitive but who could win against the Pettys and the Smokey Unick Pontiacs. If I remember Junior Johnson drove the 59-60 Chevys and since he was down on power compared to the other makes, he was the one that started the drafting behind another car and won some races.